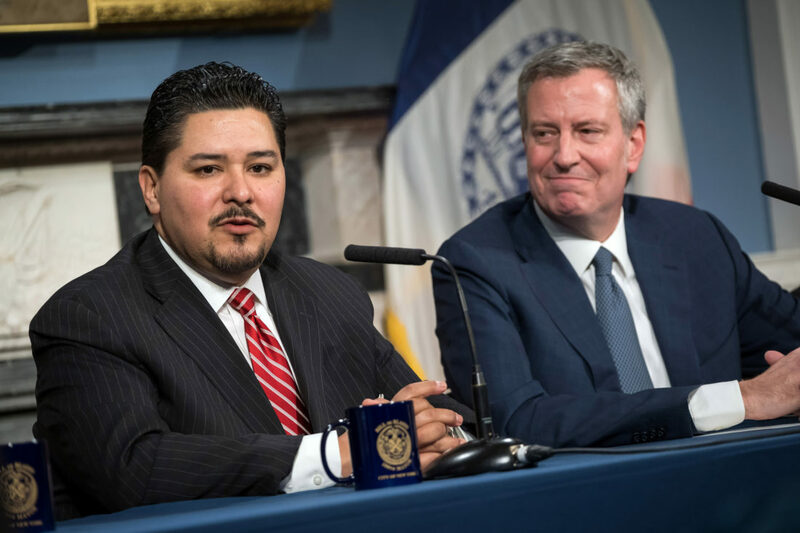 Ever since the city launched a push to scrap the entrance exam for its vaunted specialized high schools, Chancellor Richard Carranza has made it clear that he doesn’t believe a single test should be used to make school admissions decisions. In an exclusive back-to-school interview with Chalkbeat on Friday, he said that also goes for the city’s gifted and talented programs. Just like specialized high schools, gifted programs are deeply segregated. Only 22 percent of students in gifted programs are black or Hispanic, compared with 70 percent citywide. And just like specialized high schools, admission to most of the city’s gifted programs hinges solely on the results of an exam. Most students enter gifted programs when they’re in kindergarten, so they are only 4 years old when they take the test — an approach that Carranza questioned. A full transcript of our interview with the chancellor is coming soon. We’ll have interesting insights about Carranza’s relationship with his predecessor, what he thinks about the city’s Renewal turnaround program now that he’s had time to get to know it better, and the problems he’s trying to solve with a recent bureaucratic overhaul. Here are some highlights to hold you over until then. In one of his very first moves as chancellor, Carranza spared a storied Harlem school that was slated for closure. Since then, he has shaken up the school’s leadership, initiated new partnerships, and brought in a different support structure. It’s just one example, but it could be a hint of what’s to come during Carranza’s tenure. The school that won the reprieve is a part of the mayor’s high profile Renewal program, which aims to boost student learning by offering social services and a longer school day. The program has shown mixed results, at best, and many Renewal schools have been shuttered after failing to make progress. Carranza indicated there could be more closures ahead: “Let me be clear: I’m not scared of closing a school if it’s not serving the needs of the students,” he said. Did Carranza push City Hall to do something about segregation at specialized high schools? City Hall has indicated that its plans to overhaul admissions at the city’s vaunted specialized high schools had been in the works for some time. Indeed, de Blasio promised to do something about the stark underrepresentation of black and Hispanic students at the schools during his first run for mayor. Carranza wouldn’t reveal much about what happened behind the scenes in the lead-up to the city’s June announcement that officials would lobby to scrap the exam that serves as the sole entrance criteria for specialized high schools. The chancellor said he brought up the issue in his talks with the mayor before coming onboard, and said his boss shared the same vision. “I can tell you the mayor is passionate about making sure that our schools are just as diverse as our city,” Carranza said. Asked whether he personally played a role in the decision, Carranza would only say that the mayor “knew what he was getting,” when he was tapped to be chancellor. Originally posted on Chalkbeat by Christina Veiga on August 17, 2018. Alex Zimmerman contributed reporting. Chalkbeat is a nonprofit news site covering educational change in public schools. Don’t blame it all on the exams. That is an easy way out. Blame it on the way the schools are run. Don’t blame the teachers either.They are overwhelmed. Primary schools (k _ 6) need smaller class size. Ten to fifteen students in a class. Individual teaching, knowing the needs of each child, intensive attention. Even love and caring. Then you will find the children who can and should make the elite schools. That is the solution. But it won’t happen. The exams will be blamed. the teachers will continue to be blamed. There should be a test, but only students who fail the test should be admitted. Once they’re in school, if they study and work hard, they should be expelled. Starts with families and their values. Encourage families to give rich educational experiences by encouraging parents to speak to their children, encouraging parents to teach their children kindness, encouraging parents to set education as a priority! It’s the community that improves schools. The burden can’t fall solely on public systems. Look at the desirable schools -the children come from families that actively works on developing their children. Focus on families of each community. Stop watering down the competitive schools, making all NYC schools go on a spectrum from mediocre to worst. Bring up the standards of social values of at-risk schools. Apparently, this “educator” did not take abnormal psychology in college. The Stanford-Binet and WISC proved decades that indeed, a single test can determine giftedness. I am afraid his lack of insight will create policies that will have significant negative effects for decades to come for the truly asynchronous child.